It is the beginning of August, and the dog days of summer are hard upon us. Dog days? Since no reasonable canine would wish to sizzle in this heat and cook in the oppressively steamy air, I check the origin of the phrase. That much for the Almanac and its dog days. I am not a farmer, just a mere mortal who hates heat. I do not take kindly to any of this and already think winter thoughts. Deep cool snow drifts. Blue shadows. Hard nip of frost. Ice cracking. Fingers cold to the touch. Ah! We always paddle in the morning to catch some cooler breeze and see animals coming to drink or just be. But today we came close to sundown. It is still hot, sticky and not great. Never mind. We are pushing off, which consists of me crawling in first because my new hip is still maddeningly stiff, and John doing a young elephant maneuver and jumping right in from the back. 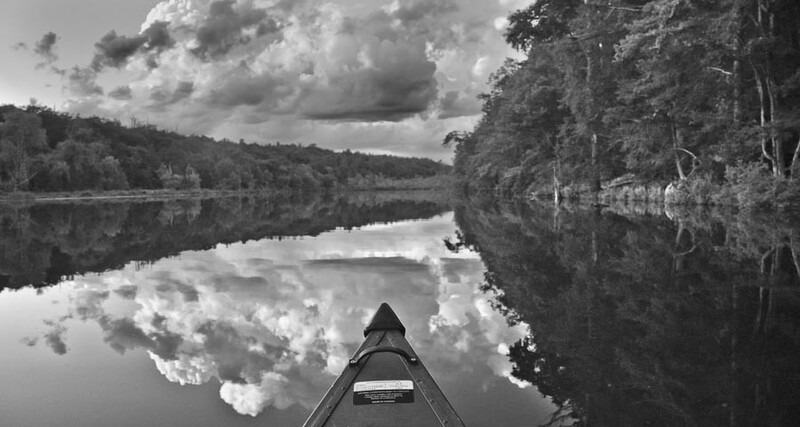 We named our Canadian 14-foot Radisson canoe Edy after its previous owner, who bought it after he retired with a sole purpose of paddling with his married daughter when he was finally free to indulge his fatherly love. And unlike Julia, our folding 17-foot green-and-yellow canoe which went with us clear around the country last fall and created quite a sensation due to her unusual upside down open umbrella principle, Edy is ordinary in appearance, simple in construction and ready for any punishment we bestow on his hard body. We jump into it, smear ripe blueberries all over it, make it carry the garbage John fishes out of the lake, and drag it on coarse gravel. We also take Edy places, and tonight we let him float in the reflected clouds as much as he likes. 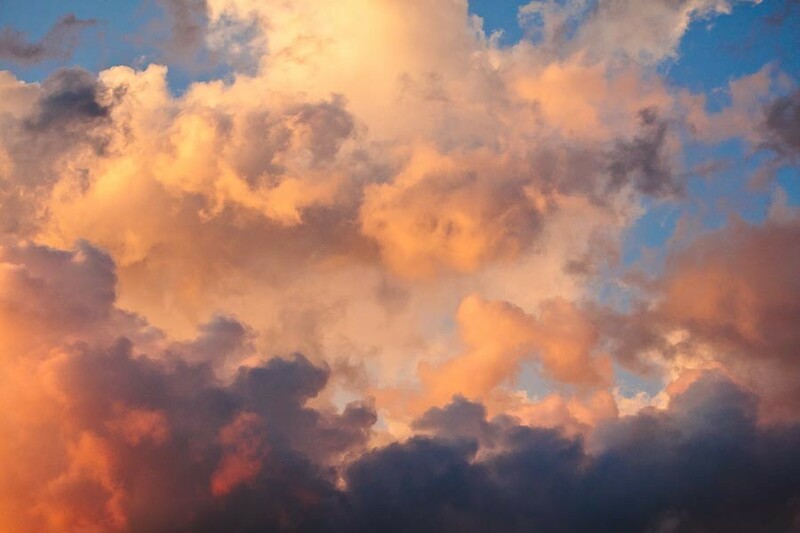 Soon the sun dips, fishermen pack their bags and leave, and we—and the clouds—stay. We know what animals we may meet because we have been here often this year, but as the evening thickens our chances of seeing any are dwindling. Edy moves well and we do not hurry; a paddle stroke here and there, no splash, just a gentle pull of the blade and a sense of the immediate conversion of our muscle power into a simple linear movement. 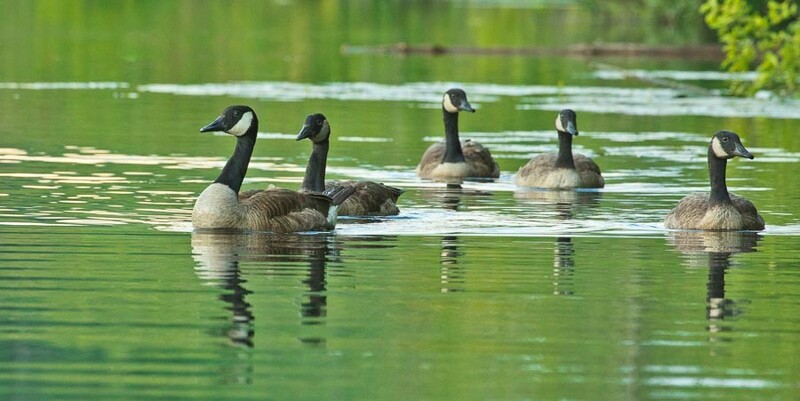 We pass my favorite clump of ferns and grasses — now fading in the stubborn heat — when one of two families of Canada geese living on the lake slips out of the bushes just ahead of us. This is the larger of two clans: two parents and three chicks, almost as big now as adult birds. But instead of swimming away, the geese turn and approach us. Closer. Closer. It had been a good hour since we came, and now it is getting seriously dark. 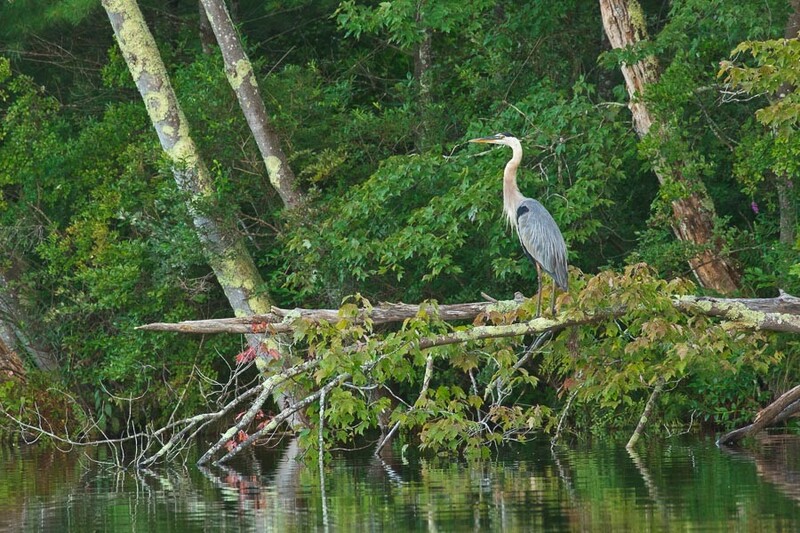 But here comes another resident of the lake and settles on a fallen maple trunk just a few paddle strokes from us: an adult Great blue heron in his rich breeding plumage tinted with rust. He sits. We float. Time passes. It is all very still and very quiet. 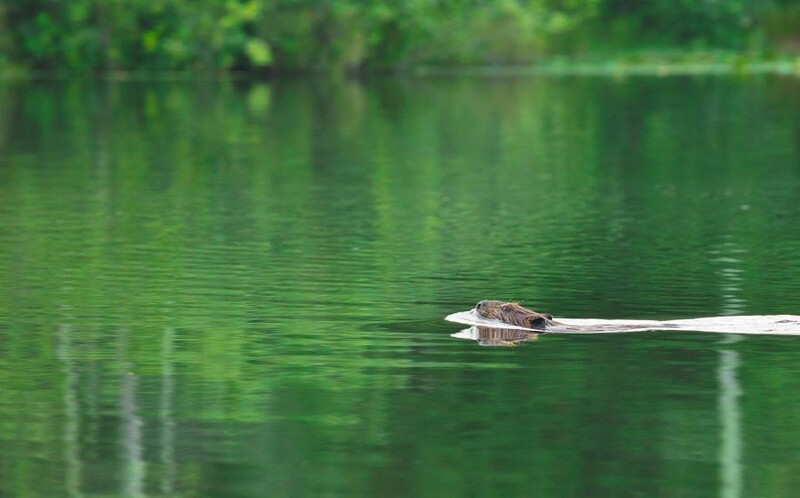 And now a young beaver is crossing the lake on his way to the lodge; he may well be one of the newly weaned babies we saw only a few weeks ago, swimming so close we could have touched it with our paddles. There are three active home mounds along the lake, and two are erected close together to accommodate a growing family: no strange unrelated beaver would dare to settle that close to the main lodge. And as we turn Edy around and paddle away, we see the last colors of the evening, sky high and slowly burning into the night. For more photography from Yva Momatiuk and John Eastcott, visit http://www.momatiukeastcott.com/.